Eyelet Machines M3 banner eyelet bundle. 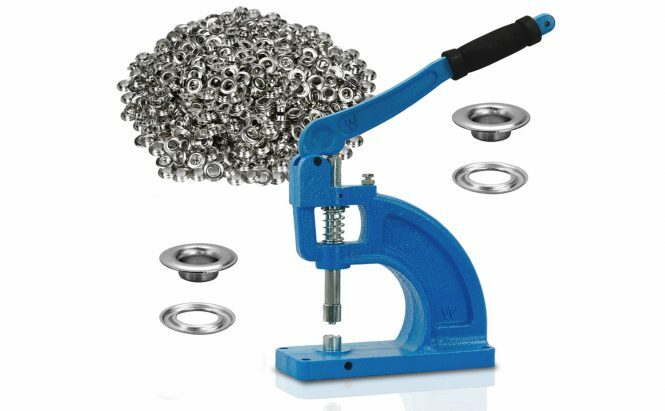 Made of cast iron, heavy duty grommet machine but still portable. Self piercing: cuts a hole and sets an eyelet simultaneously. Long, heavy, solid handle generate enough leverage to punch through the very thick banner materials. Foam wrap gives extra grip yet comfort. 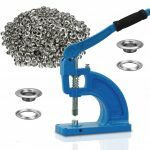 Snap holding punch head holds the eyelet automatically, making the eyeleting easier, faster and more precise! The base is bored so you can mount it to a table or use it as a portable unit. The adjustable stop screw gives you just the right amount of pressure to close the eyelets properly.